Australian Unity is one of Australia’s oldest and largest companies offering a range of financial services that include 485 visa health insurance. The graphs below show impressive claims of $655m between 2013/14, but this is only a section of the overall business too. 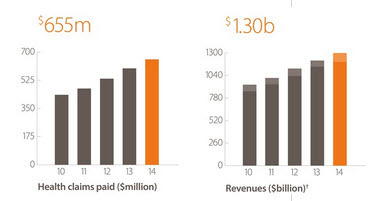 Australian Unity carries $1.30 billion in revenue alone. Outside of health insurance the company offers an investment arm, healthcare, and even a retirement living organisation, providing services to more than half a million Australians. There are two options for 485 Visa Health Insurance when it comes to Australian Unity. The first is ‘Budget Workers Cover’ which carries a price of $84.85 for singles. It has public hospital cover for overnight accommodation, theatre fees and day surgery. It also allows you to choose your own doctor when in hospital and make claims for specialist consultations and doctors as well. A key feature of this policy is that there is a $0 excess. The second policy option is workers cover plus which is almost double price at $182.40 (with a $500 excess) or $174.50 with a $0 excess. With this premium policy you have private hospital cover as long as the hospital has an agreement with the health fund. There is also cover for out-of-hospital doctor and specialist fees (eg seeing your local GP), some out of hospital pharmacy and even preventative health benefits. How Cheap Is Australian Unity 485 Visa Health Insurance? Australian Unity is a not-for-profit health fund. This means that they don’t need to pay dividends to shareholders, unlike many of their competitors. While HIF has the cheapest 485 visa health insurance (as of the 13/04/2016) at $88.42 it does require public hospital stays to be shared room which may deter many individuals who want a private room. The Product Review table below shows real reviews from Australian Unity customers. While not all reviews are form 485 visa health insurance customers, they do provide some general feedback on what customers think of the brand. 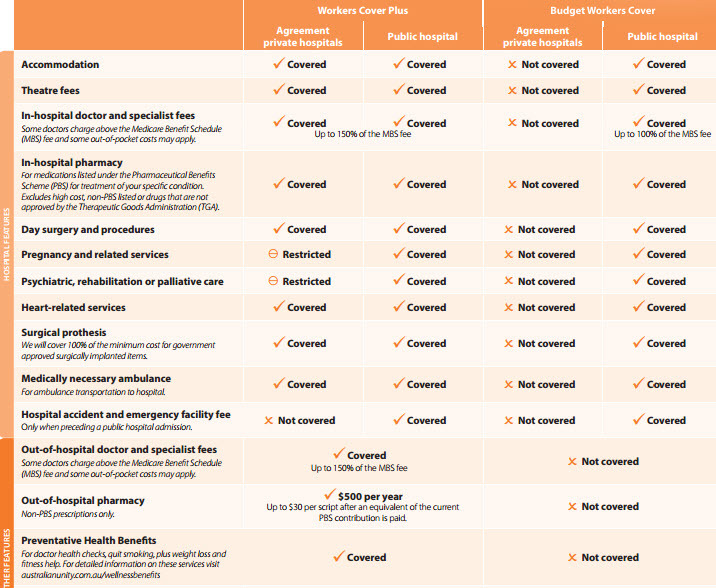 At a score of 2.1/5 the health fund is in the middle of the range when if comes to Australian health insurance companies. Some companies which score higher are IMAN with a score of 3.9/5 and HIF with a score of 3.6 from 16 reviews. Brands to do worse are Medibank and worst review score was BUPA.